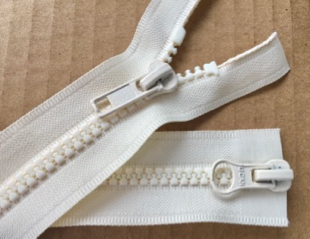 Home > SEPARATING or JACKET > Jacket Zippers > Ivory #5 Molded 2-way- 40"
40" - Great for jackets & robes. Easily shortened from the top for your project, just order "top stops". This zipper has an "over the top" zipper pull. Which can be accessed from inside or outside your project to make your project reversible. Molded Tooth Zipper or Vislon type from YKK or "sport" zipper. Molded tooth is the tissue, Vislon is Kleenex, sport is the type of clothing it has usually been used in. 2-way separating means that the zipper zips up from the bottom as well as down from the top. This zipper is a #5 or 5mm across the closed teeth & I'd recommend it for kiddie covers, jackets, vests, hoodies or robes.